By now, hopefully you’ve read this article about some of the crazy Star Wars rumors floated over the past few years. It’s perfect timing too because some new facts about The Force Awakens were also revealed today, bringing balance to the Force. Entertainment Weekly posted a ton of content Wednesday, and are teasing Luke, Snoke and Maz stuff for Thursday. 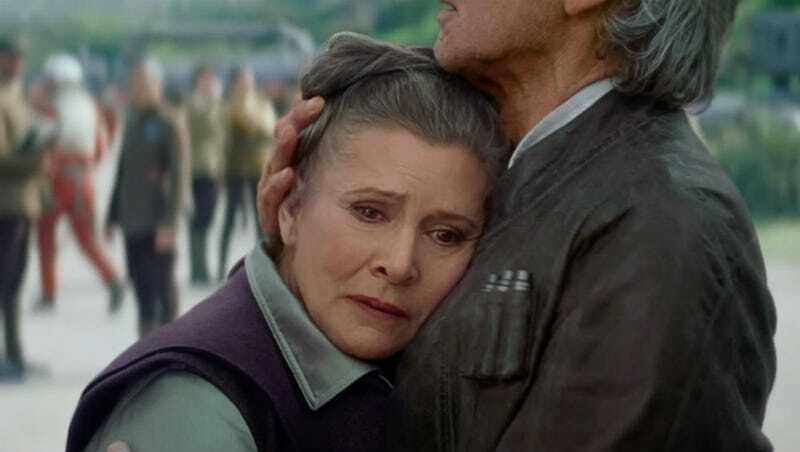 For now though, we learned that in The Force Awakens, Leia Organa isn’t referred to as princess anymore. Well, except in one case. Hmm, I wonder who that could be? Hopefully it’s someone who can cheer her up because, according to actress Carrie Fisher, Leia is really down over the course of Episode VII. Why could that be? Well, this second EW article might have a few clues. It contains a ton of new images but also three particularly interesting tidbits. 1. “Rey was ditched on Jakku by her family when she was a child and has no idea why—or why they never returned.” Could that be Leia hiding her daughter from a life of persecution? Is that why she’s depressed? It sounds plausible. 2. “Unlike Rey, [Finn] has learned a lot about Luke Skywalker — but he has been taught he was a villain who destroyed the benevolent Empire.” If the galaxy thinks Luke is a bad guy, well, they probably feel the same way about his sister. 3. “We were very lucky to get to have [Gwendoline Christie] in the movie. She’s not in many scenes, but her presence is powerfully felt when she’s there.” I’m now very bummed too, knowing that Captain Phasma isn’t in the movie a lot.